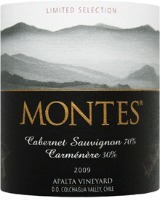 Why the sudden Carmenere kick? Well, because I was the beneficiary of a selection of Carmenere blends as a result of being included in a “twitter tasting” hosted by the Wines of Chile a few months ago. Yes, I’m sometimes (often?) slow in getting my reviews published to the blog. But hey, better late than never, right? Anyway, on to the wine. Beyond the fancy language on the label, we have a very nice wine here — which doesn’t surprise me, as I’ve enjoyed nearly every bottle I’ve Montes I’ve ever tried; they are a “reliable producer” in my book. Bright, open, and expressive red and black berry fruit aromas jump into the nose, with a slight touch of earth and bell pepper. The palate does not disappoint, offering similarly forward fruit that is ripe with red berries, sweet black fruits, and hints of earth, spice, and mild tobacco. Tannins and acidity are both soft, but there’s enough structure to keep the wine from being described as “fat” or out of balance. The finish is kind of quick but that’s hardly a complaint, considering all the juicy delicious fruit at the front end. I matched this successfully with a smattering of dishes, including chicken pot pie, cheese and potato pierogies, and stuffed cabbage (yes, I had take-out from the Polish restaurant). It’s enjoyable on its own but also completely versatile with a variety of victuals. At around or about $15, it’s a good value.